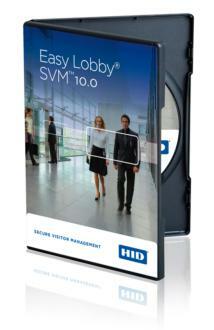 HID Global’s EasyLobby® Secure Visitor Management (SVM™) software is the main application for processing visitors (for example, ID scanning, record creation, badge printing, Watch List screening, check in and checkout and email notification). The solution improves security by enabling organizations to identify exactly who is in their facilities, while enhancing the professionalism of an organization by streamlining the visitor check-in process and providing high quality visitor badges. Install one SVM license on each Windows workstation where visitors are processed. Manage numerous SVM workstations through a central database (SQL Server or Oracle). Administrator™is an enterprise-class, central administration utility for SVM. It provides the user with administration, monitoring and reporting functionality using the SVM database. Administrator is a separate application from SVM. Install Administrator on any workstation that has network access to the SVM database. Customers receive one (1) Administrator copy with each purchased version of SVM. If a customer requires additional copies of Administrator, they should purchase additional copies separately. Create and manage your organization's badge templates, by category. Create and manage all of the user accounts for the guards or receptionists that will be operating the SVM badging software in each lobby. Setup and manage an automated, scheduled employee import process, ensuring the visitor list is always updated. Manage all settings and options on each SVM badging station from the central administrator console. Setup and manage EasyLobby’s Secure Visitor Management eKiosk™ self-registration and eAdvance™ pre-registered software.